In 1916, at the height of World War I, brilliant Shakespeare expert Elizebeth Smith went to work for an eccentric tycoon on his estate outside Chicago. 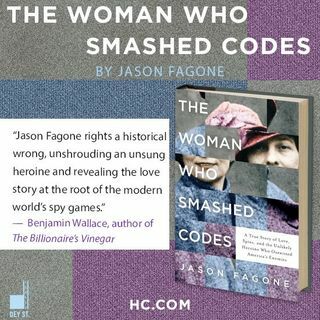 The tycoon had close ties to the U.S. government, and he soon asked Elizebeth to apply her language skills to an exciting new venture: code-breaking. There she met the man who would become her husband, groundbreaking cryptologist William Friedman. Though she and Friedman are in many ways the “Adam and Eve” of the NSA, Elizebeth’s story, ... Más informaciones incredibly, has never been told. JASON FAGONE is a journalist who covers science, sports, and culture. Named one of the “Ten young Writers on the Rise” by the Columbia Journalism Review, he is a contributing writer to the Huffington Post Highline, and writes for a number of outlets, including GQ, Esquire, The Atlantic, the New York Times, Mother Jones, and Philadelphia magazine. He is the author of Ingenious and Horsemen of the Esophagus, and lives in Philadelphia, Pennsylvania.